Nairobi — Kenya's first Olympian Nyantika Maiyoro has passed on at a Kisii Hospital on Sunday aged 88 years after being diagnosed with tuberculosis. 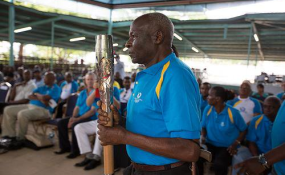 The 88-year old Maiyoro who was Kenya's first ever Olympian at the Melbourne Games in Australia in 1956 has been in and out of hospital for the last few years and had trouble clearing his bills until the National Olympic Committee of Kenya (NOCK) came to his aid, promising to clear the bill. Nyantika who was admitted after he had complained of chest pains for about three months ago, went to a coma before breathing his last Sunday evening. NOCK acting Secretary General, Francis Mutuku who has been in contact with the family confirmed the sad news, promising to stand with the family in this difficult period. "We have been in touch with Nyantika on daily basis and in the last few hours he had gone into a coma but he passed on later. As NOCK we promise to support the family as we strive to improve the farewell of other athletes who have done Kenya proud in the past," Mutuku said. On Monday February 18, The Interior Cabinet Secretary Dr Fred Matiang'i had moved in to rescue pioneer Olympian.